When Hurricane Katrina struck on August 29, 2005, it brought untold devastation to the Gulf Coast region. During the hurricane and in the floods that followed, nearly 2,000 people were killed, an additional million were displaced, and more than a million housing units were damaged or destroyed, according to the Data Center. Approximately 134,000 of the damaged or destroyed housing units were located in New Orleans and accounted for 70 percent of the city's occupied housing. While many people who were affected by Hurricane Katrina have completely rebuilt their lives in the more than 10 years that have passed, they may not yet be clear of the dangers posed by the historic storm. 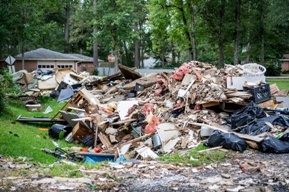 That is because people who were involved in the hurricane cleanup, demolition, and rebuilding efforts may have been exposed to potentially hazardous substances, such as asbestos. A group of six naturally occurring fibrous silicate materials, asbestos was a common component in insulation, roofing tiles, and other building materials made between the 1940s and 1970s. However, asbestos use was banned in 1989 after exposure to asbestos particles was linked to the development of mesothelioma—a rare, aggressive, and particularly deadly form of cancer that affects the lining of the lungs, heart, abdominal cavity, or testicles. Because mesothelioma often goes undetected until in its late stages, the prognosis for patients diagnosed with this disease is often quite poor. Even more concerning: Mesothelioma can develop years and even decades after the initial asbestos exposure. People who may have been exposed to asbestos during the hurricane cleanup should talk to their doctor if they experience symptoms such as a severe cough, shortness of breath, or pain in the chest or ribs. If you or a loved one were diagnosed with mesothelioma that you believe was caused by exposure to asbestos during Hurricane Katrina cleanup, the knowledgeable attorneys with Neblett, Beard & Arsenault can investigate your case and help you explore options for compensation. Our attorneys work on a contingency fee basis, so you will not be charged for our services until your case is settled and there are no upfront costs to worry about. Contact Neblett, Beard & Arsenault today to schedule an appointment for a free initial case consultation.